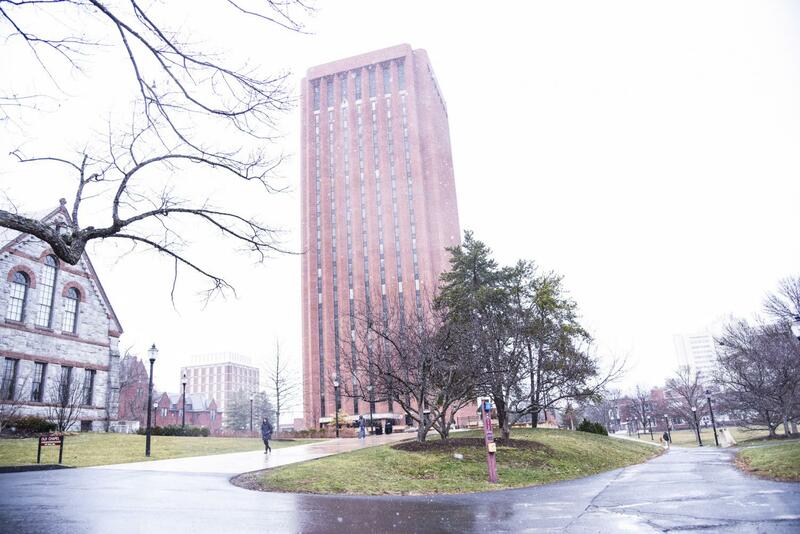 With the wintry weather we’ve been having, residents can only hope that April showers may actually bring May flowers. Fortunately, the Halau Hula Ka No’eau Hawaiian Dance Ensemble brought something brighter to Amherst. On Tuesday, April 3, Artistic Director and Kumu Hula (formal master teacher of Hula) Michael Pili Pang brought the dance and music ensemble of seven all the way from Honolulu, Hawaii to perform “Sacred Dances and Legends of Hawai’i: When Gods Mingled with Mortals” at the Bowker Auditorium. The company was supposed to perform last March, only to be snowed out—a full-house audience turned away. Despite similarly unpleasant weather conditions, they made their return to equally, if not more, excited viewers. From the beginning, it’s clear that the dance ensemble operates with a different spirit than other companies. You won’t often find the artistic directors or choreographers of a dance company on stage with their performers, but Pang is a notable and much appreciated exception. He first introduced the audience to the background of the company and the structure of the night’s performance. Afterward, instead of slinking back behind the curtains, he took his place among the ensemble as musician, singer and narrator. His presence was interwoven with that of his dancers, as well as the entirety of the show. This not only knitted the night’s five acts together with an engaging imagery-laden narration, but also showcased the many talents of the Kumu Hula and artistic director. The first act, Hula Pahu, a Dance for the Gods, existed before written language as a call for the gods to bless Hawaiians. Kumu Hula Pang prefaced this section with the legend of Pele, Goddess of Fire, responsible for creating the Hawaiian Islands with her earth-moving powers. Three women and one man stomp their heels and sweep their arms to strong, drum-driven beats, creating lines with flexed feet and extended palms, their gazes stoically following their hands. The movements are repetitive, moving in phrases along with an entrancing chant, as an “enticement” to reveal the gods’ presences. As the dances move through history, audiences arrive in the Hawaii of the mid-1800s with the second act, Hula Ku’i, a dance style that “sews together” elements of modern and ancient hula. During this period, Hawaii was under British colonization, and hula was outlawed under Western rule. It wasn’t until 1873, when William Charles Lunalilo became the first elected king of Hawaii, that Hawaiians could perform their traditional dance again. In this act, dancers wore traditional white cotton garb, while leaf le’is and bands are replaced with pinafores, puffy sleeves and vests. Even with emancipation from the British, the dance style still retains elements of the Victorian Period: instead of moving in place, lines of dancers weave through each other, and link arms in pairs as if in a social dance. The music remains traditionally Hawaiian. However, the chants and drumbeats have since been replaced with singing. Acts 3 and 4 introduced Queen Lili’uokalani’s story and three legendary creatures that are part of Hawaii’s mythos. A diagonal line of three men, wearing wide bow-like loincloths and leaf le’is, began by chanting and beating rhythm sticks, followed by a female soloist accompanying herself on castanets-like instruments. Her voice was sweet and lilting, precise in its intonation. After her performance, the rest of the six dancers entered, diving into a high-tempo, sprightly dance. Instead of the solidly-grounded style of Hula Pahu, they begin to travel across the stage. In a diagonal, the dancers chug and sway back and forth, yelling callbacks to the music, as if in a jesting conversation. In comparison with the rest of the show, the Hula ‘Auwana—modern hula—of the fifth act incorporates images of “stereotypical ‘Hollywood’ hula” into the presentation of the dance. Performers, now in solos or duos, dressed in floral tee shirts and cargo shirts, or grass skirts and spangled bikini tops. The style was lighthearted and loose, the typical wavy arms and swishing hips making an appearance. In one song, a duo of a male dancer and a female dancer winked playfully at each other while miming along to the lyrics of a 70s English-lyrics hula song, a slide guitar twanging along. The final piece was specially commissioned by Ranjanaa Devi, director of the Asian arts and culture program at the Fine Arts Center. Since specific dancers needed for the usual final act were missing from the cast that night, Pang created this new piece by incorporating motifs from “Hula Pahu” with the movements in formations from more modern styles. It was disappointing that the last act, a brave try at melding the past and present, should fall so short. Pang used the word “storm” to describe the conflict artistically expressed—a force as mesmerizing as it is ominous. Rumbling, crashing sounds of a rainstorm were superimposed over an Annie Lenox song as the first drumbeat-heavy track used in the dance invoked the gods. I searched to find places where the rhythms converged, where the melodies would play with each other. I strained my musical intuition to find those moments of harmony, but to no avail. Like an internal storm, the three soundtracks clashed with each other. The mission of the Halau Hula Ka No’eau Hawaiian Dance Ensemble alone makes it a gem of a dance company: “To dance throughout the world…To promote cultural awareness and happiness…To create value and make a difference…” Their dedication to bringing together community, strength, tradition and modernity is like no other. Despite the distance between Hawaii and Massachusetts, Amherst is warmer and richer now after being visited by the history and dance of the islands.